London, The Arab Weekly – At a time when Russian air strikes are raining bombs on the Syrian city of Aleppo, adding to the destruction wrought by nearly five years of civil war, one group is looking to preserve what has been lost and build for the fu­ture. The Aleppo Project, launched by the Centre for Conflict, Negotiation and Recovery (CCNR) at Central European University in Budapest, bills itself as an “open collaboration among Syrian refugees, students, academics, policy experts and oth­ers to come up with ideas on how to rebuild urban life after conflict”. It is looking to the post-conflict future and the reconstruction of Aleppo. The recent history of Aleppo, which had been the largest city in Syria, is the history of the Syrian war, changing hands a number of times over the course of the con­flict. Syrian rebels took control of large parts of Aleppo early in the conflict, and government forces subsequently besieged the city. Since then, the north-western Syrian city has been in contention between President Bashar Assad’s forces and various Syrian rebel factions, resulting in widespread destruction, particularly after the government’s much criticised bar­rel-bomb campaign and the ensu­ing toll on Aleppo’s infrastructure and civilian population. Aleppo’s Old City, including its historic covered souks and ham­mams, has largely been destroyed, while both the citadel and Grand Mosque of Aleppo have been dam­aged by shelling. 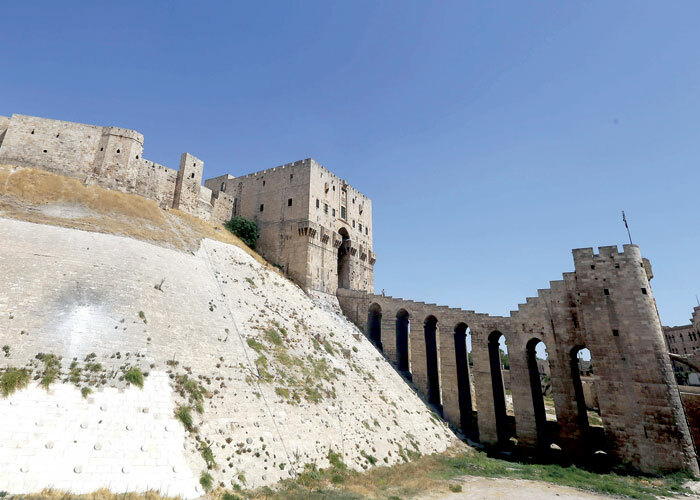 The Aleppo Project is developing crowd-source mapping software in cooperation with the Graduate School of Architecture, Planning and Preservation at the Univer­sity of Columbia in New York. This software, which project personnel said they hope will be ready in De­cember, will allow visitors to mark damaged buildings, relate stories and upload pictures. This will help preserve important elements of the cultural heritage of Aleppo that can be used for reconstruction. The interactive map is to be cre­ated in collaboration with the gen­eral public, with Aleppians — those still in the city and those who have been forced to flee — drawing atten­tion to properties that have been destroyed and posting pictures of what the city looked like before the conflict. “The aim is to create a living memory of the way Aleppo was. This will also help the reconstruc­tion process to identify the way things used to be and confirm the level of destruction that has now happened,” said CCNR fellow and US Foreign Service Officer Jay Heung. Russia’s entry into the Syrian conflict complicated the situation, with few believing an end to the conflict in near. This, however, has not sapped the enthusiasm of those working for the Aleppo Project, who want to ensure that reconstruction efforts have been prepared before the end of the conflict. “Other cases, such as Sarajevo, show that thinking about recon­struction started rather late, rough­ly after the end of their conflicts. One of the aims of this project is to avoid that mistake and start think­ing about reconstruction related issues while memories are fresh,” Tokmajyan said. Most importantly, the Aleppo Project seeks to empower Syrians in the reconstruction process. “Reconstruction will be prob­lematic and. at worst, illegitimate if local actors are excluded or given little say,” Tokmajyan said. “We try to empower existing and emerging Syrian experts to get involved in this process and prepare. Locals are more familiar with their neighbour­hoods, streets, lifestyle and city-specific issues and sensitivities and can significantly boost the chances of success. He said visitors to the Aleppo Project website can make contribu­tions by submitting Aleppo-related articles, photographs and stories. The contributions are posted on the project’s blog in English, Arabic or any other language used in Syria. “The aim of our blog is to stimu­late discussion about the history, (the) present and the future of Aleppo,” Tokmajyan said.